Among several other games, Sega is bringing Sumo Digital’s Team Sonic Racing to gamescom. 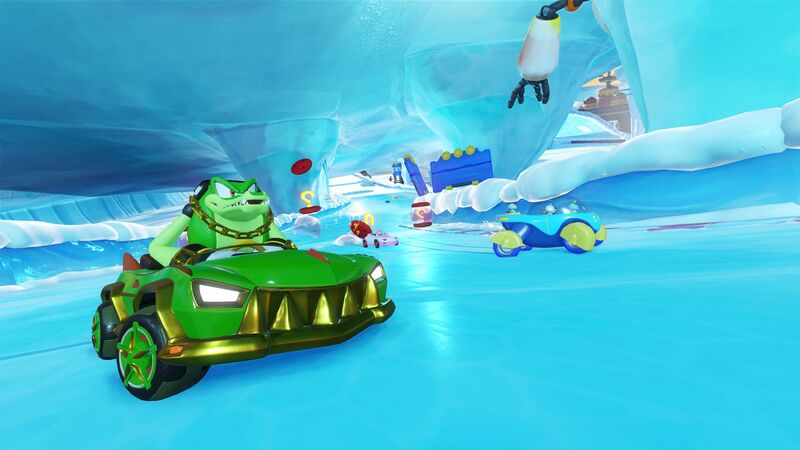 While it was already announced that new track Ice Mountain would be part of the demonstration, Sega also announced a new team will also be a part of the demo build for the event. The new team, Team Vector, comprises Vector the Crocodile, Blaze the Cat, and Silver the Hedgehog. In addition to the new characters and track, fans in attendance will also be the first to play as previously announced Team Rose, which comprises Amy Rose, a group of Chao driving one car, and Big the Cat. For those not on the up and up with the latest Sonic the Hedgehog news, Team Sonic Racing is the third in a series of Sega racers developed by Sumo Digital, which started with Sega & Sonic All-Stars Racing and continued with Transformed. The new core concept of Team Sonic Racing is cooperative play during a race. This is achieved by a list of “Team Mechanics,” which includes various ways for teams to help each other get speed boosts, trade items, and target rivals. Team Sonic Racing is set to hit the track on the PlayStation 4, the Xbox One, the Nintendo Switch, and the PC in winter 2018.